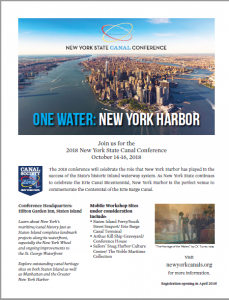 One Water, New York Harbor is the theme for the 2018 New York Canal Societies’ Canal Conference to be held on October 14th. – October 16th. at the Hilton Garden Inn, Staten Island NY. 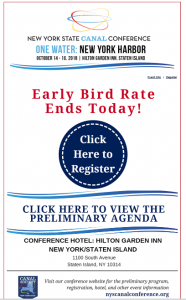 The conference will celebrate the role that New York Harbor has played in the success of the State’s historic inland waterway system. 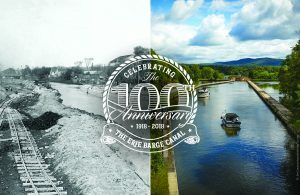 As New York State continues to celebrate the Erie Canal Bicentennial, New York Harbor is the perfect venue to commemorate the Centennial of The Erie Barge Canal. The Canal Society of New York State was formed in Buffalo in 1956 at the annual meeting of the New York State Historical Association. In that first year, membership was open to anyone interested in the history, folklore, and engineering of former canals and the present condition of the state’s remaining man-made waterways. This is still he primary focus of Canal Society Members today. 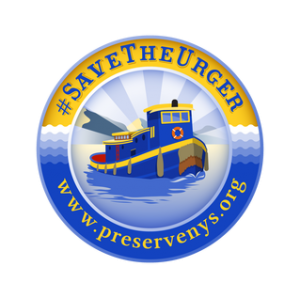 The Preservation League of New York State is seeking support for its efforts to protect the historic Tug Urger and other Erie Canal vessels that provide an authentic link to the past. 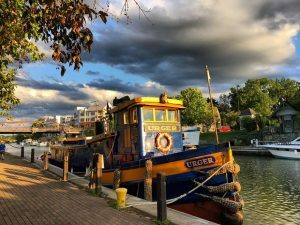 The League recently learned that the New York State Canal Corporation under the New York Power Authority (NYPA) has plans to beach the tugboat Urger, flagship of the Erie Canal and beloved “teaching tug”. This vessel has introduced thousands of school children and members of the public to New York’s navigable waterways, reinforcing the role of the Erie Canal in making New York the Empire State. The Tug Urger used to travel up and down the canal system for school field trips and public events. The Canal Corporation and NYPA want to pull it from the water and make it a dry-land exhibit at a NYS Visitor Center off the Thruway in Montgomery County. NYPA’s plans would permanently disable the Urger and prevent it from returning to service. The League is launching an advocacy campaign to call attention to the plight of the Urger and call on the Canal Corporation and New York Power Authority to work with stakeholders to develop a plan for the fleet of historic canal vessels, more than a dozen of which are slated to be scuttled off Long Island to create artificial reefs for sport fishing and recreational diving. According to Jay DiLorenzo, president of the Preservation League, “The Erie Canal is an engine for recreation and tourism with significant economic benefits for canal communities, businesses and New York State. The Preservation League has been working for years to help communities in the Erie Canal Corridor address their unique preservation challenges and revitalize Canalside assets. #SaveTheUrger. Through more than $600,000 in grants, technical services, workshops, awards and the Industrial Heritage Reuse Project, the Preservation League has helped individuals, not-for-profits and municipalities throughout the canal corridor. Loans from the Endangered Properties Intervention Program (EPIP) have added more than $300,000 in support. “As we mark the 100th. Anniversary of the Barge Canal, it seems like a remarkably poor time to remove historic resources from the National Historic Landmark NYS Canal System” continued DiLorenzo. “It’s hard to imagine the future of the canal system without the Tug Urger and other significant historic vessels on the water. 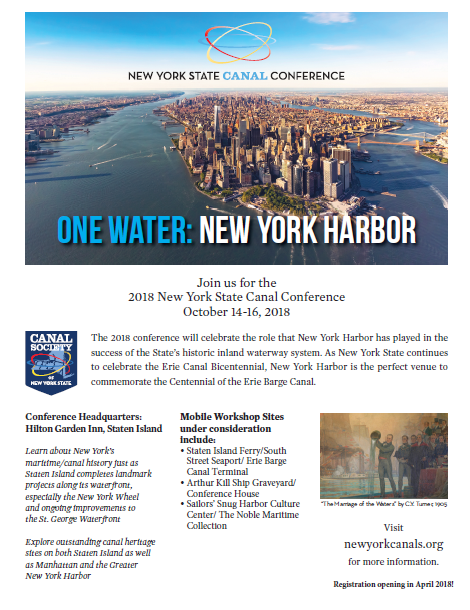 These vessels convey the sense of the New York State pride, stewardship, and heritage that are integral to a thriving, living waterway,” said Bob Radliff, Executive Director of the Erie Canalway National Heritage Corridor. “The canal tugboat Urger has served the New York State Barge Canal for more than a century and until very recently has been a highly effective traveling educational exhibit” said Mark Peckham, maritime historian and retired director of the NYS Bureau of Historic Sites. “The Urger symbolizes the pride New Yorkers feel about the National Historic Landmark canal system. It is essential that she continues to be maintained and operated with pride” according to Dan Wiles president of the Board of Directors of the Canal Society of New York State, “The 1901 Urger already had a storied career even before plying Barge Canal waters in the 1920’s serving as a fishing boat on Lake Michigan. As one of the State’s maintenance workhorses, its presence overlaps nearly all the years of the Barge Canal, now celebrating its centennial. It has been appreciated by generations across these many years and across New York State. It is one of the essential links between that past and the future. We all need it to continue this mission on the waterway, being shared by communities throughout the Canal Corridor” In addition to the effort to save the Urger, the League is also calling on the Canal Corporation and the New York Power Authority to work with stakeholders to develop a plan for the remainder of the fleet of historic canal vessels, which currently numbers 57. More information and a petition is located on the Preservation League’s website The Preservation League of New York State invests in people and projects that champion the essential role of preservation in community revitalization, sustainable economic growth and the protection of our historic buildings and landscapes. We lead advocacy, economic development and education programs across the state. Glassmaking innovations in Corning have shaped the modern world, from the first electric light bulbs for Thomas Edison and the invention of optical fiber for telecommunications, to the glass used in modern flat screen displays. That story all began with a voyage on New York State’s waterways. In 1868 the Brooklyn Flint Glass Company relocated to Corning via New York’s waterways. It evolved into the company that is today known as Corning Incorporated. In celebration of the 150th anniversary of this pivotal journey, The Corning Museum of Glass will launch the GlassBarge, a 30 x 80 canal barge equipped with Corning’s patented all-electric glassmaking equipment. The journey begins in Brooklyn Bridge Park on May 17th. 2018 and will then travel north on the Hudson and then begin its trip westward along the Erie Canal before making its way to the Finger Lakes. Once on the Canal the GlassBarge is scheduled to make stops at Albany, Little Falls, Sylvan Beach, Baldwinsville, Fairport, Lockport, Buffalo, Medina, Brockport, Pittsford, Seneca Falls and Watkins Glen. A ceremonial last leg of the trip will take place by land concluding in Corning with a community-wide celebration on Sept. 22nd. In addition to sharing the story of glassmaking in Corning, the GlassBarge tour will emphasize the continued role of New York’s waterways in shaping the state’s industry, culture and community. GlassBarge is the 2018 signature event for the statewide celebration of the Erie Canal Bicentennial The GlassBarge journey will also be celebrated back in Corning with the re-installation of the Crystal City Gallery, which shares the story of how Corning became one of the premier centers for glass cutting in the United States. July 28th – 29th. Lockport – Upson Park. August 25th – 26th Pittsford – Carpenter Park at the Port of Pittsford. For more information on the Corning Museum of Glass GlassBarge click here or e-mail glassbarge@cmog.org. The Erie Canal, the foremost engineering marvel of the 19th century, sparked the imagination of artists in America and abroad. On display through September 23, 2018 This companion exhibition to Enterprising Waters: New York’s Erie Canal looks at the art inspired by the canal and the opportunities it afforded artists both trained and untrained working in a variety of media, such as paintings, photographs, sketches, transfer-printed earthenware and beadwork. A selection of 60 works comes from the collections of the New York State Museum, the Arkell Museum at Canajoharie and other cultural institutions and private lenders from across the state. 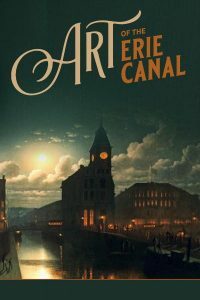 These works represent just a small sample of the wealth of Erie Canal art made over the course of its first 150 years. Four roundtables celebrating the Champlain Canal Centennial have been scheduled for May. Each will feature a presentation, an informational sharing session, networking opportunities and a discussion period. May 17th. 2018 from noon to 3pm. at the Schuyler Room of the Saratoga Town Hall 12 Spring Street Schuylerville. Craig Williams will present Building the Champlain Barge Canal: Treasurers in the NYS Archives. Craig Williams is a retired senior historian at the New York State Museum and a trustee of the Canal Society of New York State. He has spent over 50 years researching and documenting New York’s canal heritage. Using the unique resources of the New York State Archives along with oral histories. Williams will present stories about the engineering achievements and the people involved in the construction of the Champlain Canal. May 19th. 2018 from 1pm. to 4pm. at the Crandall Public Library, 251 Glen St. Glens Falls. Erica Wolfe Burke will present Researching the People of the Feeder Canal. Erica Wolfe Burke is an archivist and special collections librarian at the Folklife Center at the Crandall Public Library. She assists families and genealogists researching upstate New York ancestry and has offered a series of family history workshops. Her presentation will culminate in a community archiving event with the Folklife Center as the repository for the images shared. Preregistration is required for all events. $15 includes material and lunch. “Researching the People of the Feeder Canal” is free and does not include lunch. 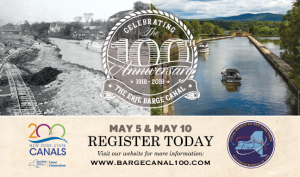 The Canal Society of New York State in conjunction with the New York State Canal Corp and in partnership with the Centennial Celebration Committee are hosting two events to mark the centennial opening of the Erie Barge Canal in 2018. Join the conversation at this daylong public forum in which presenters discuss canal history and its continued value today and for the future. Registration $40, includes breakfast, coffee breaks and lunch. East Guard Lock just west of Kendrick Rd. 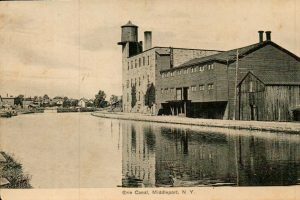 Canal by Coach Tour: Following the festivities join Canal Society of New York State President Emeritus Tom Grasso and other experts for a guided tour by motor coach of the remarkable canal sites in eastern Monroe County Registration: $60. Includes lunch, bus, printed guide and more. On the morning of May 10th. 1918 a group of engineers, contractors, workers and a few prominent citizens gathered on the east side of the Genesee River in Genesee Valley Park to inaugurate a monumental, audacious and revolutionary accomplishment in New York State’s long and storied canal history. Water for the first time was let into the newly completed expansion of the Erie Canal or “Teddy Roosevelts Ditch”. Five days later the new Erie-Barge Canal was opened for through traffic from the Great Lakes to the Hudson River. A new era had begun. Sponsors: New York State Canal Corporation, Canal Society of New York State, Create a Brand, City of Rochester, Erie Canalway National Heritage Corridor, Bergman Associates, and John & Eve Graham. A large four story building that stood on the northwest side of the canal had a rich history and several different names. It started as a flour mill which was destroyed in 1859 and came back to life in 1883 as the Ontario Preserving Company. The property was leased to the company by Buel P. Barnes who stipulated that it could only be used as a canning factory. Mr. Barnes at that time owned the flour mill on the corner of North Hartland and Sherman Road and wanted to make sure he had no new competition. Managed by Mr. Charles Francis with Mr. Jay S. Vary as superintendent, processor and chemist, the plant was known for packing peas which were shelled every morning by local housewives and picked up by horse and wagon before noon so they could be processed by evening. As the cost of peas made the product no longer profitable for the plant, it switched to pineapples, naval oranges, strawberries, cherries as well as a large variety of other fruits and vegetables. The plant had the first acetylene gas units to replace the old kerosene lamps as well as a steam engine to provide additional power and Middleport’s first sprinkler system for fire protection. The plant was an active employer of around 500 local residents and several additions had to be made to the building to house the new equipment. In 1891, the Sprague-Warner Company of Chicago,Illinois purchased the plant and the name was changed to the Batavia Preserving Company. The Middleport plant continued to preserve fruits while another plant in Batavia handled most of the vegetables. The plant was again sold in 1913 when the Batavia Preserving Company decided to leave Western New York. After several more owners who ran it as a canning company, the last name on the building was Longview Farms Inc. which was run by Louis Catalano and R.C Walthew. After a destructive fire in the 1960’s, the building became a safety hazard and was demolished in 1967.